40 degrees below zero is cold by any measure. But, in the world of superconductors it's a record hot day. Superconductors.ORG herein reports an increase in high-Tc to 233K (-40C, -40F) through the substitution of thallium into the tin/indium atomic sites of the X212/2212C structure that produced a 218 Kelvin superconductor in January of 2009. 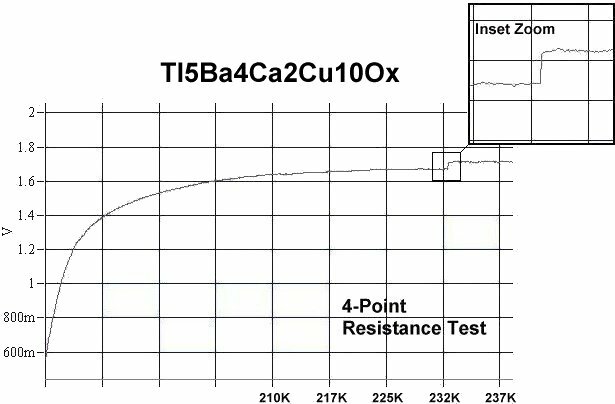 The host material producing the 233K signal has the chemical formula Tl5Ba4Ca2Cu10Oy. One of several resistance-v-temperature plots used to confirm this new record is shown above. And a composite magnetization test, showing the Meissner transition, is shown below right. A flashing line has been added to illustrate the diamagnetic shift in slope below Tc. The quiescent noise is a result of zooming in on a small volume fraction. This very high Tc material, like previous record discoveries, was designed to exploit planar weight disparity (PWD) along the "c" axis of the 9212/2212C structure (shown at left). In this case a very heavy insulating layer in the upper part of the structure (Tl5Cu4) opposes a single copper chain in the lower part. 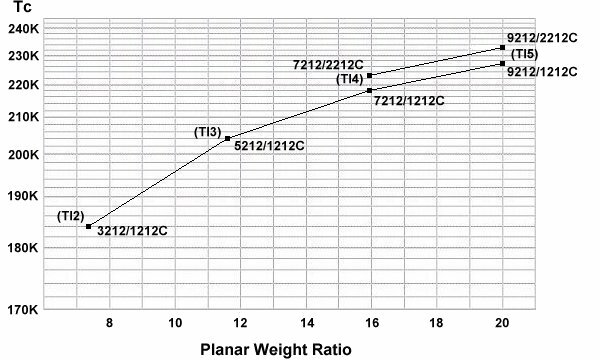 Even though the copper chain branches, the planar weight ratio remains high - around 20:1. 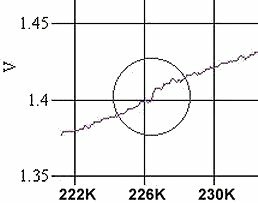 The structure that produced the previous 218K record material had a PWR just over 16:1. Weaker resistive transitions also appeared near 227K, 223K and 218K. The 227K step (shown above) most likely results from a 9212/1212C structure forming as a minority phase; the 223K results from a 7212/2212C structure; and the 218K step from a 7212/1212C structure. Below 218K the other minority phases disappeared into the noise. As a result, a 1212C pellet with less thallium and copper was synthesized to discover the Tc of the 5212/1212C and 3212/1212C phases. In that pellet transitions appeared near 204K and 184K. All of these transitions were then plotted, producing the below Tc-v-PWR graph. The rate of slope declination suggests that 240K may be attainable. Since we are now just a "stone's throw" from room temperature, this discovery is being released into the public domain without patent protection. Other researchers are encouraged to examine this material and its structure.